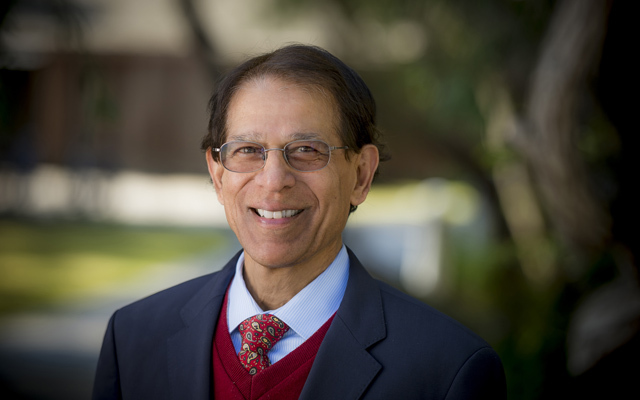 Dilip Jeste, MD, Distinguished Professor of Psychiatry and Neurosciences and director of the Center on Healthy Aging at UC San Diego. While even the best wines eventually peak and turn to vinegar, a new study by researchers at University of California San Diego School of Medicine suggests a paradoxical trend in the mental health of aging adults: They seem to consistently get better over time. The findings are published in the August 2016 issue of the Journal of Clinical Psychiatry. Conversely, Jeste and colleagues noted high levels of perceived stress and symptoms of depression and anxiety among adults in their 20s and 30s participating in the study. “This ‘fountain of youth’ period is associated with far worse levels of psychological well-being than any other period of adulthood,” he said. Conventional notions of aging have largely described it as an ongoing process of physical and cognitive decline, with little discussion about mental health except in the context of decline. It has been broadly assumed that the mental health of older people mirrors their worsening physical and cognitive function. But Jeste, who has long studied the phenomenon as the Estelle and Edgar Levi Chair in Aging and director of the Sam and Rose Stein Institute for Research on Aging, both at UC San Diego, said actual research, though limited, produces mixed findings. The reasons for these differences in results aren’t obvious. There is measurement variation across studies, with different researchers emphasizing different indicators that, ultimately, produce different conclusions. Nonetheless, the commonality is in finding improved well-being in the second half of life. Jeste emphasized that this study was not restricted to psychological well-being, but included “mental health”, which is broader in definition and also includes satisfaction with life, and low levels of perceived stress, anxiety, and depression. In the latest study, Jeste and colleagues examined the physical health, cognitive function, and other measures of mental health in 1,546 adults, ages 21 to 100 years, living in San Diego County, who were selected using random digit dialing. Participants were almost evenly split by gender, stratified by age decade, with an oversampling of adults over age 75. The linear nature of the findings was surprising, said Jeste, particularly in magnitude. The oldest cohort had mental health scores significantly better than the youngest cohort, though the former’s physical and cognitive function was measurably poorer than the latter’s. The reasons for improved positive mental health in old age are not clear. Some previous research has shown older adults become more adept at coping with stressful changes. They learn, said Jeste, “not to sweat out the little things. And a lot of previously big things become little.” However, another important explanation may be increased wisdom with age. A number of studies have shown that older individuals tend to be more skilled at emotional regulation and complex social decision-making. They also experience and retain fewer negative emotions and memories. These are all collective elements of wisdom, as defined by the researchers. Michael L. Thomas, PhD, first author of the paper and assistant research scientist in psychiatry at UC San Diego School of Medicine, cautioned that “like many other investigations of this type, it was a cross-sectional study, and thus a snapshot of data. Also, there may have been a survivor bias — i.e., less healthy adults do not survive into old age”. Yet, he also pointed out that older adults in this study were physically more disabled than younger ones — so this was not a sample of super-normal healthy adults. Other co-authors include: Christopher N. Kaufmann, Barton W. Palmer, Colin A. Depp, Averria Sirkin Martin, Danielle K. Glorioso, and Wesley K. Thompson, all at UC San Diego. Funding for this research came, in part, from the National Institute of Mental Health (T32 MH019934, R01 MH099987, R01 MH094151, K23 MH102420) and the Sam and Rose Stein Institute for Research on Aging at UC San Diego. Regents of the University of California.